Your sure to find a costume as unique as you are at All Shook Up. Our inventory is like a box of chocolates, you never know what you are going to get! 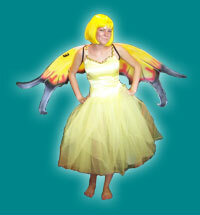 We have pages featuring just a few types of costumes including halloween, theme party, Burning Man, and theater. All contents of this website are © copyright 2006 All Shook Up, All rights reserved.